For myself, hardly imagine that the equipment are handled by helicopter, before saw the video shows helicopter transporting part of drilling rigs. Then start to understand the cost of building a road in nowhere and the inconvenience of helplessness on the isolated site if something goes wrong unexpected. This time, we build the tanks for a drilling rig outside of the real world, which need to be transported by helicopter. All are customized for the transportation convenience. 1) 8 sets customized vertical mud tanks as storage tanks, with dimension 2200x2200x5800mm, the 8 sets mud tank can be put into 4 ea. 40feet high cubic containers. The total weight is smaller than 5tons, which can be lifted by helicopter transportation. Floater ball inside to measure the level of drilling mud inside. 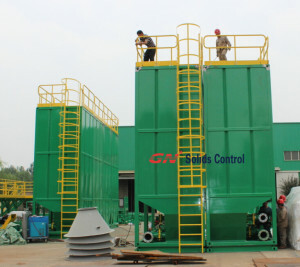 2) 2 sets customized horizontal mud tanks as mixing tanks, with dimension 5800x2200x2200mm, the 2 sets mud tank can be put into 1 ea. 40feet high cubic container. The total weight is smaller than 5tons, which can be lifted by helicopter transportation. Except this, there is another application also need helicopters, small ones, for small rigs, normally diamond core drilling, the small helicopter only can handle less than 1 ton pieces. So smaller design are required. And as clients from site said, hydraulic parts are preferred, as people have more common sense on this. GN also sent a few systems to PNG, Fiji, which every piece can be disassembled to less than 1ton parts, equipment including, in an easy way, then reassembled to a complete system like Lego toys. While the control is still plug and play, has been kept very simple design. Freely to let us know the specific requirement, then can customize any proper solution for you.